I’m reviewing INSIGNIFICANT EVENTS IN THE LIFE OF A CACTUS. You can scroll down to read (Also linked via the President’s Day button). Carl at Boys Read Boys Rule! discusses the books in the Cybil’s non-fiction category and his experience as a judge. Ashlyn Avery at What Shall We Read Next is back with a review of The School for Good and Evil by Soman Chainani. Author June McCrary Jacobs is featuring a non-fiction middle grade read by Author Sarah Wassner Flynn entitled, ‘1,000 Facts About the White House’. Check out her giveaways, too! Completely Full Bookshelf is recommending The House on Mango Street by Sandra Cisneros. Suzanne Warr at Tales from the Raven spotlights The Sweetest Thing, by Sherri Winston. Patricia Tilton at Children’s Books Heal is reviewing The Theory of Hummingbirds by Michelle Kadarusman. Mark Baker at Carstairs Considers returns with a review of The Haunted Lighthouse by Penny Warner. BOOKS 4 LEARNING has a feature on the classic A WRINKLE IN TIME. Andrea Mack at That’s Another Story has a review of the newest Newbery, HELLO, UNIVERSE. 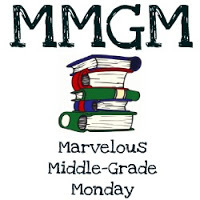 Karen Yingling always has great MMGM picks. Be sure to read her review today along with the many other choices she posted the past week. You MUST email me your link by Sunday evening (11 PM Eastern Time) in order to be included in the list of links for the coming Monday. Thanks for spreading the middle grade love and for being a part of this awesome tradition begun by Shannon Messenger and carried on here at ALWAYS in the MIDDLE! This entry was posted in MMGM Links. Bookmark the permalink.